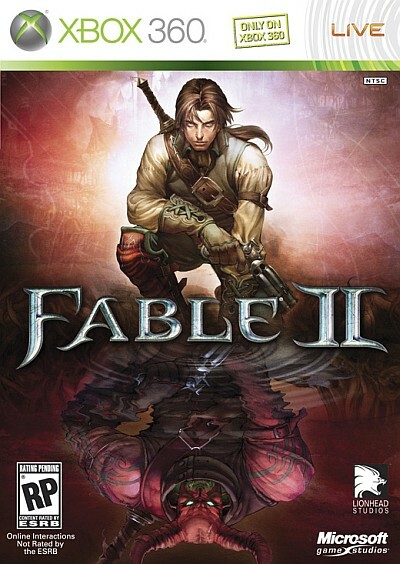 Fable 2 was a game I was quick to pick up when it came out. Peter Molyneux designs some very fun games and even if they don’t always live up to his promises they do always push game design forward. Fable 2 is no exception in this and brings together both simple story design with new tries at innovating the moral game design. Add in some innovative use of a trusted dog companion and a great concept in environmental change based on decisions and you have a fun game. Since I played this game they have added two DLC pieces which I will comment on as well. Fable 2 starts you off with some decent control of your character design. As the game progresses you can add tattoos, change hair styles, color of hair, and your wardrobe. All of these changes have an effect on your interaction with other people and the comments they will give you. These interactions will also affect your good vs evil and purity vs corruption which are your moral compasses through out the game. Your character ultimately comes down to the decisions you make and based off those decisions your character will be shaped and grow. Besides clothing and material appearance changes you will find that your diet will also affect your character’s appearance as will skill choices. Eating meat and pies will make you fatter and some will make you more corrupt. Eating vegetables and tofu will make you skinnier and purer. Simple mechanic but effective. Skills work in changing your appearance with strength based skills bulking you up and magic making you glow more with magical veins. Going good vs evil shapes your appearance and your reputation, as does purity vs corruption. People tend to like good characters and will talk with you. My first play through I went all good and pure. I ended up with a halo over my head and could walk through town with no problem. My second play through everyone but quest giving NPC’s ran in fear of me because I went evil and corruption. I ended up with horns and red skin. It would seem that the world of Fable frowns on mass murderers who sacrifice entire towns to the Temple of Shadows. The game presents you with many opportunities to do the right or wrong thing. For the most part the world doesn’t really care. Yes guards will punish you and like my second play through the peasants will run in fear but it is still simple AI. The peasants with red hair aren’t wearing kerchiefs to cover their hair because my character is known for killing them. That would be a real accomplishment and sort of what I remember being promised back in Fable 1. Still the game takes us closer in this direction than most games do and I can appreciate that. I also appreciate that other than running peasants the game doesn’t try to make you feel guilty for the horrible things you do. As far as the story goes it is a decent one of a hero/villain who has to save the world. You do so with the aid of other gathered heroes in a very linear fashion. Fable 2 tries to give the illusion of an open world that you can explore and do the story in your own time but that is a lie. It gates your movement by forcing you to do certain activities before moving forward. Now it does so in a logical format and chances are the average player will be fooled by this seemingly open world but if you break away from the story long enough you realize you are forced to progress at the speed of the story and not your own will. Along with a decent story is funny dialogue and good voice over work. The dialogue is a little cheeky at times but can be forgiven. Your dog companion is one of the best parts of the game. He helps you fight battles though kind of pitifully. Your dog also detects treasure for you to dig up or chests for you to open. This can be handy if you are not that observant of the environment or want to search every corner. Chances are your dog will find it for you. Your dog also loves you no matter what so you can always count on your dog no matter how good or evil you become. Your dog can learn fun little emotes that you can train him with from books you find or buy. The bunny hop and playing dead are favorites of mine. Besides your dogs ability to learn emotes so can you. In fact it is about the only way to interact with other characters in the game since you are a mute who can only grunt. I guess this was a way to avoid lots of written and voiced dialogue for your character. Your emotes range from distasteful like farting and growling to flirty emotes like come hither. You can shape the opinion of townsfolk with these emotes and some, reaching certain thresholds, will give you gifts. Emote animations are an interesting form of communication and are done in a fun manner here. The other thing I really liked in Fable 2 was how certain choices could be made that in turn shaped the environment. Sadly this is only done a couple of times in the game but when done I actually felt like my choices had an effect on the world. Again a slight illusion since it didn’t change the eventual outcome of the story and perhaps only changed my access to a few side quests. Still it is a start in the right direction. It gave me more reason to replay the game and see what my other choices would have given me. I would love to see more games do this. Granted it is not always feasible to create extra assets a player may never see but hopefully production will get to a point where it is easier to do. Also I give Fable 2 a nod for being smart and letting the player continue to play the game after the overall storyline is done. There are a lot of things you can keep doing and even some quests that don’t open up till after you finish the main story. They don’t even charge for DLC content to do this (I’m looking at you Fallout 3). This little feature has had me drop back into the game every once in a while. It even made me more likely to buy their DLC which I did. The first piece of DLC Knothole island was a fun little addition. There was a good bit of content there and nice level design. It made good use of a changing environment and gave the illusion of a larger area to explore than was really there. I was disappointed to see that the content was gated to your story progression. They added a good bit of new items and a fun story. It was a worthy addition to Fable 2 and felt like a complete package. The second piece of DLC was See the Future. Instead of being one area with an intertwined story you get a collection of adventures loosely linked together. Though the story is weaker than Knothole Island the adventures themselves were solid. They felt at times like content that could have been in the game for release but had to be dropped do to time constraints. The addition of new costumes was cool and novel in their use in the game. Fable 2 suffers in only that it doesn’t live up to the hype but not for a lack of trying. The game is a fun one and has a lot of opportunities for replay. Its a comfortable world and one I am happy to return to when nothing else presents it’s self. Fable 2 is another 4 star in my collection and the DLC is right there with it.